As, there are a lot of tips to follow if someone must do to get the job, here, we will explain what are the blunders that usually people make when they are looking for a job. We want to tell you sometimes these blunders can cancel the amazing job opportunity and you will always feel regret for that. So try to avoid it. Looking for Jobs in the UAE? Avoid these Blunders. When people are new in UAE, they may get confused and make a lot of blunders, we suggest you to must avoid them. People, who have no experience to visit UAE in their life, they think that they can visit the UAE at any month. We want to tell you, at UAE, month matters a lot because it is an Islamic country and it is always useless to visit UAE at Ramadan or near Eid. We suggest you research well before your visit to the UAE. Your research will help you to know either UAE has job opportunities for you or not in this particular month. If you are looking for jobs in the UAE, you must focus much on your CV and cover letter. The common mistake that most of the people make is the unfocused CV. You should keep your CV ready so that when the job opportunity will arrive, you will be able to go for an interview with the prepared CV in your hand. Mostly people don’t take it seriously and show irresponsible behavior towards the making of CV. Such people then face a great loss when they arrive in the interview with the incomplete CV and they don’t select him. One should know, in hiring, CV is the most important thing that really matters. Sometimes people want to apply for the number of seats in the same organization. We suggest you send different CV’s for different departments. It will surely put a great impression on a hiring manager. We suggest you to avoid sending unsolicited CV because most of the time, it also becomes the reason to reject you. Applying with the different CV’s will increase your chance of hiring. So, don’t make this blunder if you are really serious about getting that job. This is the most common reason for rejection. Although, the company will call you if you will have enough skills but if you are unable to speak confidently, the knowledge and the experience don’t matter at all. The first thing that the hiring manager will notice is your personality. So make sure, you are wearing a formal dress. After that, they will judge your confidence with your body language. They will judge your confidence level with the way you adopt to talk. If you have poor communication skills, don’t suppose they will ever hire you. Unprofessional behavior is one of the most common blunders that people make when they have a first experience to give an interview at UAE. It is the most common reason for rejection there because any standardized company will never compromise on professionalism. They always want to hire professionals that can make the standard of their firm more high with their great work. If you are giving an interview, don’t show unprofessional behavior if you need to be selected. Always use the Email id with the authentic name because this is the first thing from which they will judge your professionalism. 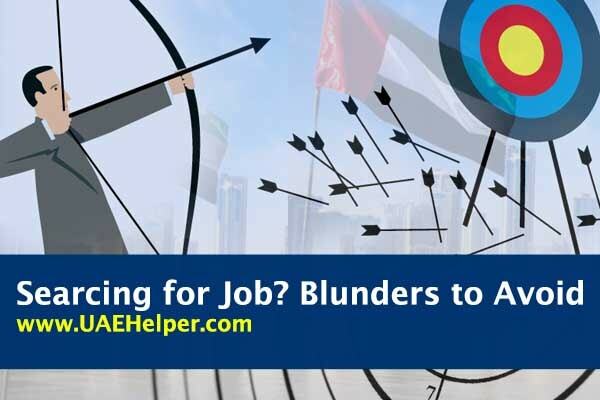 These all are the common blunders that people usually make when they are looking for jobs in the UAE. Keep visiting www.UAEHelper.com and subscribe to our jobs alerts regarding the latest jobs in UAE.